If you happened to attend one of last weekend’s performances of “A Seussified Christmas Carol” at The Winterset Stage, you witnessed something really special: a group of 37 local citizens, ranging from lower elementary school-age to senior adult, working together to bring the written word to life. What a cultural and educational gem this is for our community! 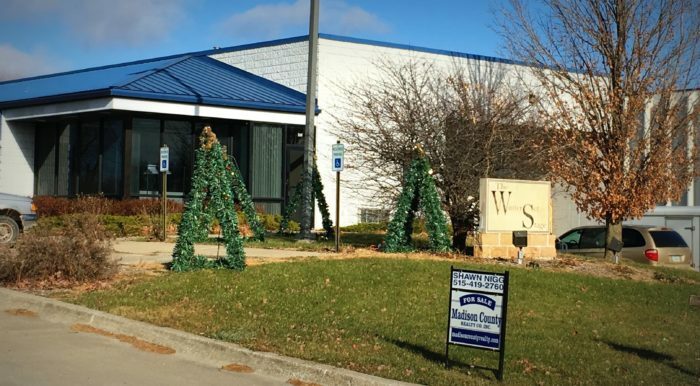 Happily for Winterset, as director and Board President Megan Barrett explained in her opening remarks before the performances last weekend, the “For Sale” sign on the lawn of their current building at 405 E. Madison Street does NOT mean the end of The Winterset Stage as an organization. 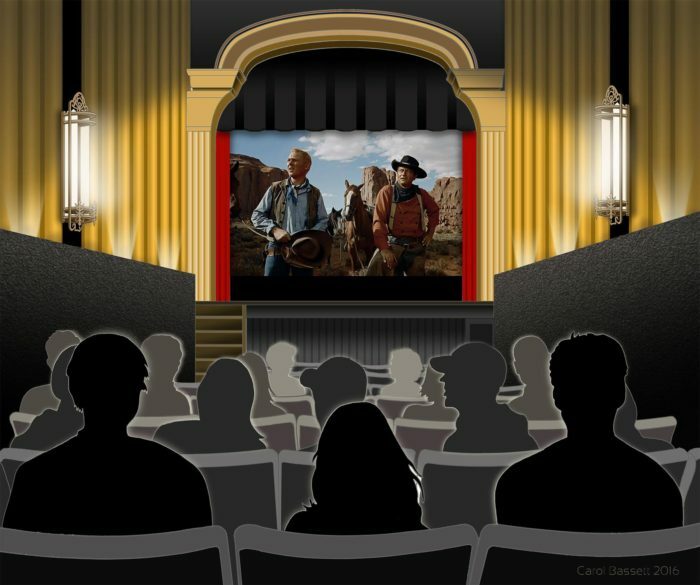 Instead, starting around June of 2017, their productions will have a new home at The Iowa Theater, freshly restored on the Winterset town square! My dad had a copy of this old photo of Winterset’s east side. I’m not sure of the date, but if you look very close, you can see one car parked way up the street near where Mi Pueblito is now. And in front of the theater building you can see a group of three people, with what looks to be a young man perusing the show information that is posted in two frames attached to those support columns, near the ground. I cannot wait to see a live performance on that old vaudeville stage. By the way, another of the incredibly talented Fons women, Mary, just published a two-part interview with sister Rebecca and mother Marianne on her blog, PaperGirl, about the renovation process. I highly recommend you check this out for a very entertaining description of the process! You’ll learn that Marianne and Rebecca are doing as much of the work themselves as they can. Marianne told Mary, “Last week I personally unscrewed hundreds of brass screws to release the old wiring and light bulb sockets from the marquee panels…. Despite having been in place out in the weather since 1928, each screw came out with just a few twists of the screwdriver. I listened to that band Alabama Shakes while doing this work.” Love! Can’t you just picture it? These excellent visuals by Carol Bassett make it all the more exciting and real! 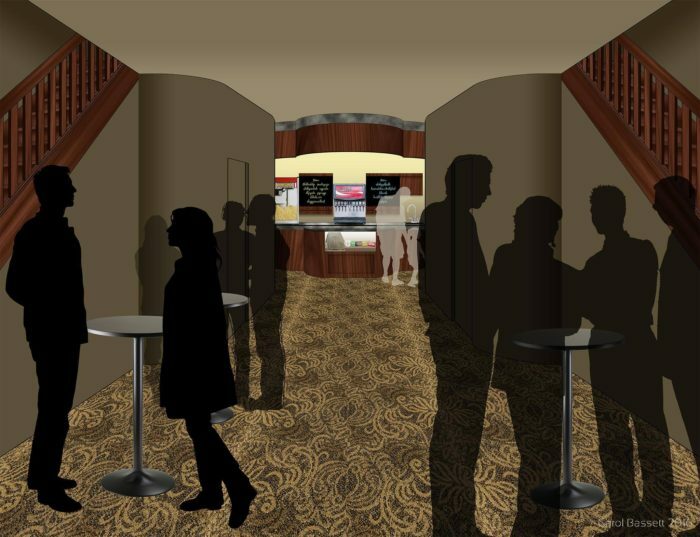 The Iowa Theater has applied for 501(c)3 nonprofit status and will soon begin accepting donations to help finish the project. I’ll help spread the news on that as soon as I know more. In the meantime, follow them on Facebook at The Iowa for real-time photos and updates. 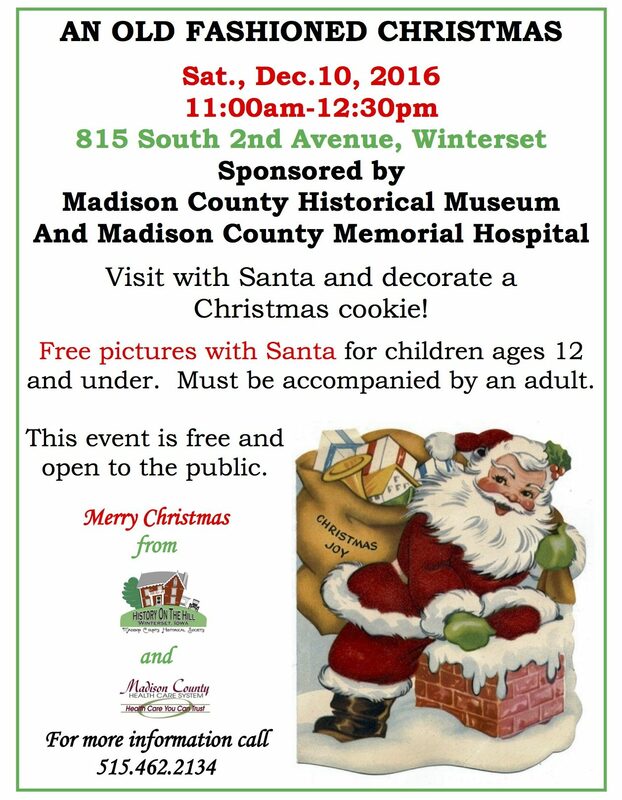 Alabaster Ministries will soon be hosting their Absolutely Free Christmas Store at the Jackson Building in Winterset. This is an outreach to families in need during the Christmas season, providing them the opportunity to select items to give as gifts, free of charge. To help make that service available, they are looking for donations of new or gently used clothing, toys, home decor… anything that could be given as a GIFT to loved ones. If you would like to help, the drop-off time for donations will be Friday, Dec 9th from 4-7 pm at the Jackson Building. If that time doesn’t work for you, find Alabaster Ministries on Facebook and send a private message to inquire. And re:home is open today too, through Saturday! 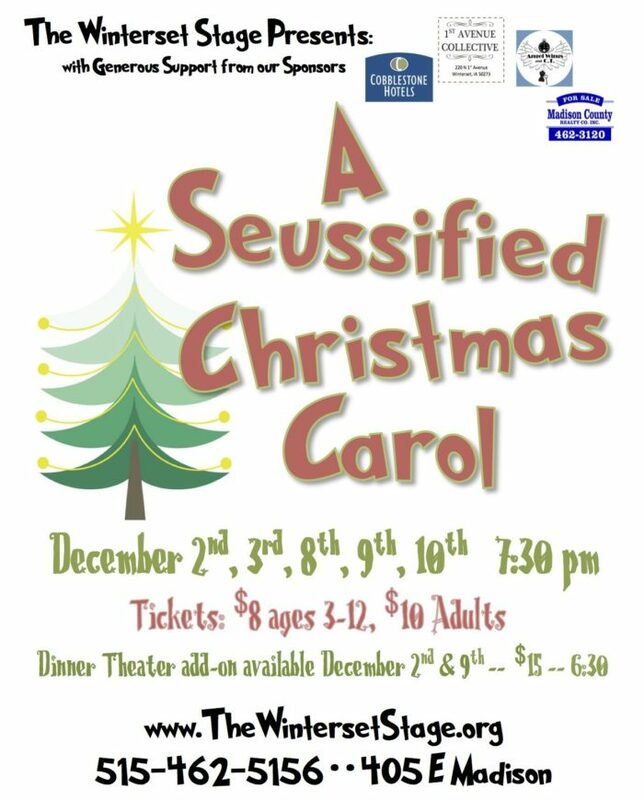 If you missed it last weekend, you still have three more chances to see “A Seussified Christmas Carol” at The Winterset Stage: tonight, Friday, and Saturday at 7:30 pm. Call to inquire about their dinner theater option on Friday before the show, catered by Hy-Vee. Celebrate the holidays with a little Charles Dickens mixed with Dr. Seuss! Tickets are going fast, so reserve yours in advance by visiting www.thewintersetstage.org/maintstage. 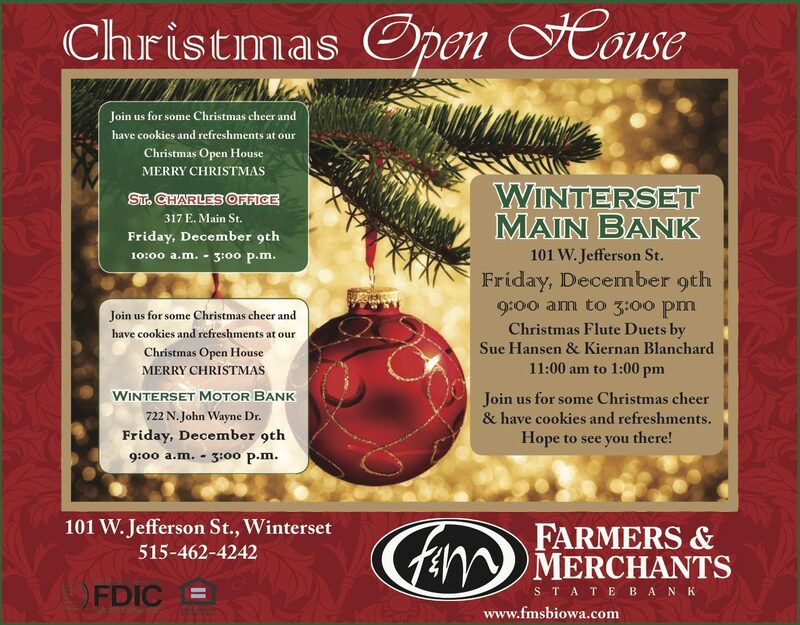 Friday is the day for Farmers & Merchants State Bank’s Christmas Open House at three locations: the main bank at 101 W. Jefferson, the motor bank at 722 N. John Wayne Drive, and the St. Charles office at 317 E. Main Street in St. Charles. And while you’re there, if you haven’t seen the Bevington Mansion dressed up for Christmas, it’s a sight to behold. This Saturday, December 10th, the Bevington-Kaser House will be open to the public for tours from 11:00 to 3:00. 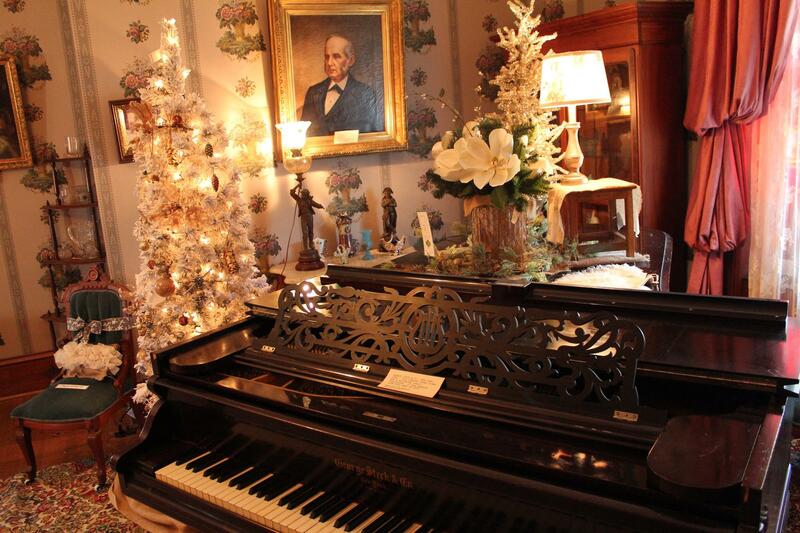 This is your last chance this year to tour the house decorated for Christmas. Don’t miss it! 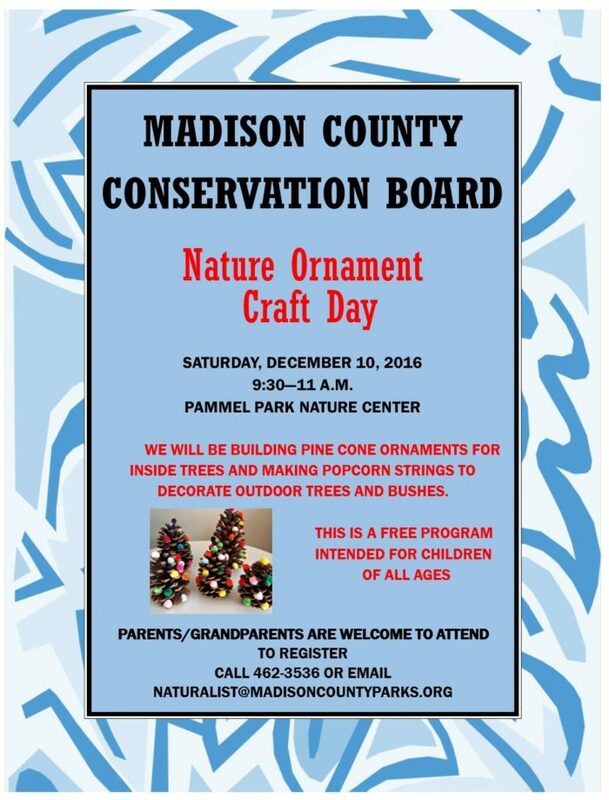 Children and adults are invited to participate in a Nature Ornament Craft Day at the Pammel Park Nature Center on Saturday at 9:30, sponsored by the Madison County Conservation Board. Call 462-3536 to register, or email Amy Holley at naturalist@madisoncountyparks.org. 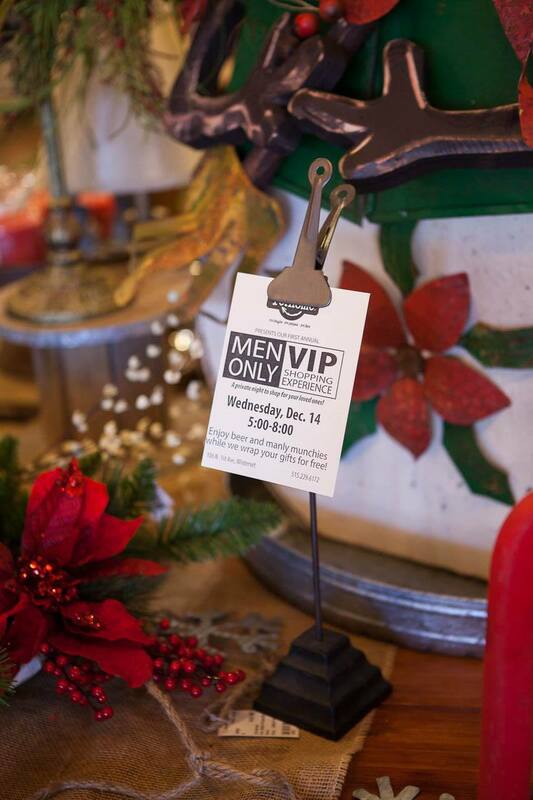 Next Wednesday evening, December 14th, several local merchants are teaming up to host a special men’s only shopping event on the square until 8:00 pm. I’m not sure yet how many merchants are involved in total, but the photo below is from re:home, and Pine Creek Ltd., Angel Wings & CT, Montross Gift Shop, Village Bootery, Ben Franklin, and several others are participating, including Rodell’s Smokehouse! Several of the merchants have also made “wish lists” available, so that Santa can be directed to the things you especially love. Genius! I’ll be getting my wish lists in place before December 14th. 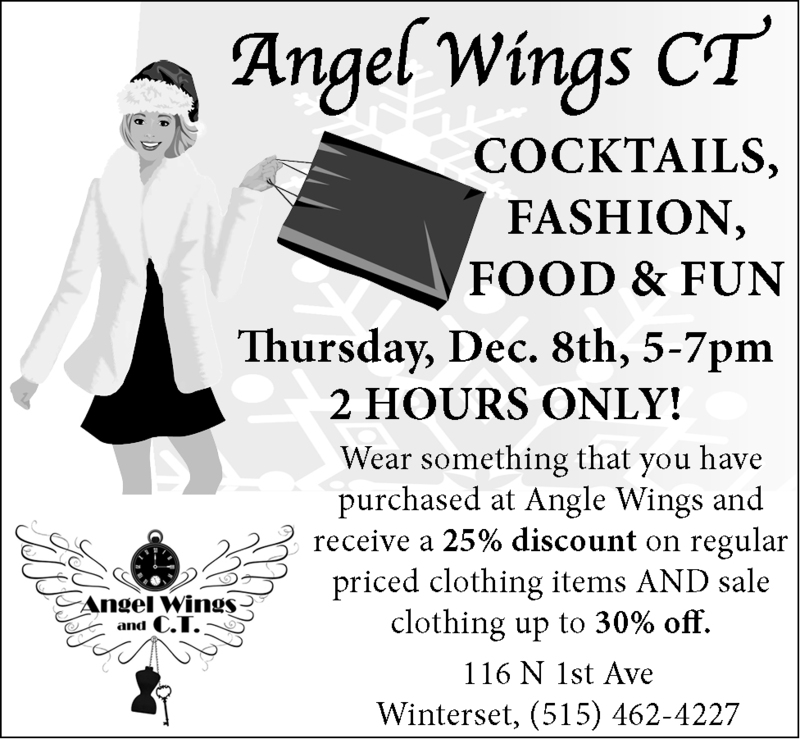 The following evening, December 15th from 5:00 to 7:00 will be a special shopping experience as well. 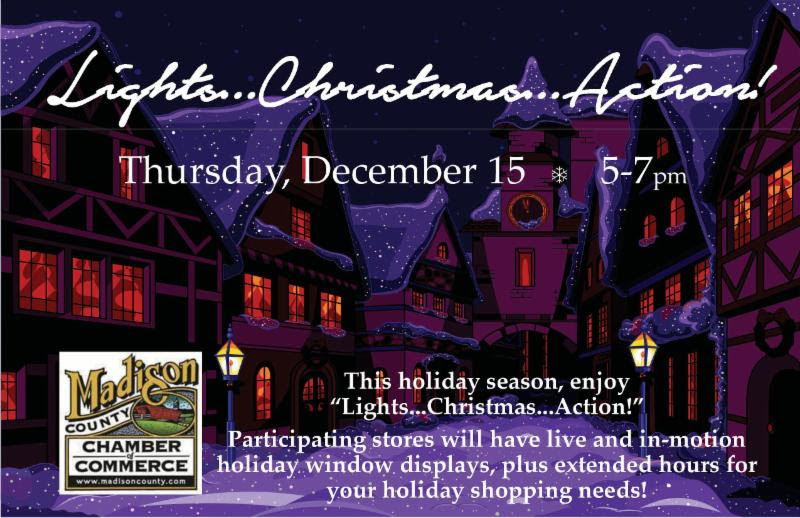 “Lights… Christmas… Action” will feature live and in-motion window displays and extended hours. 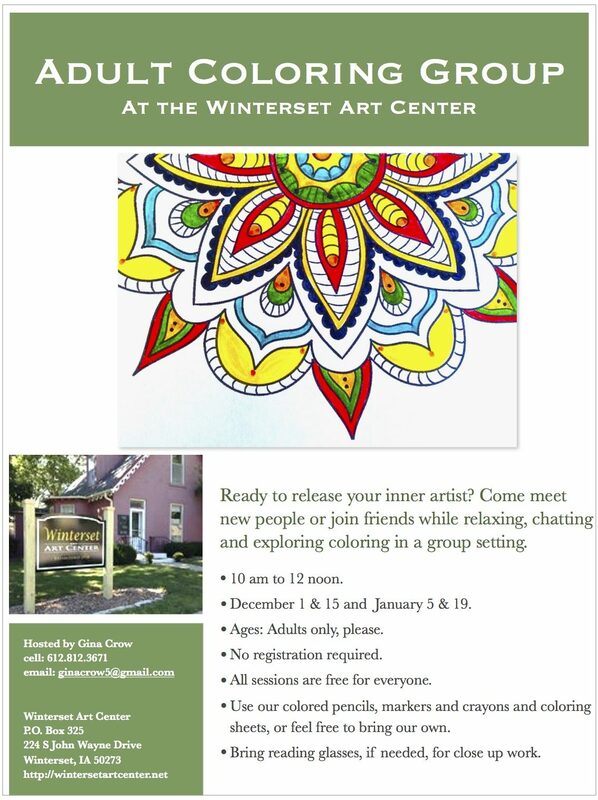 If you need a little “zen” time to sit and recover, head to the Winterset Art Center for a free Adult Coloring Group on December 15th from 10:00 am to noon. On Wednesday, November 30, Midwest Heritage hosted an Awards and Celebration Dinner to honor the 2016 and 2017 Midwest Heritage Youth Heifer Winners at the Lakeview Country Club in Chariton, Iowa. This award-winning program by Midwest Heritage aims to help youth get a start in the cattle industry. Left to right are Carson Graham, Kenna Howard, Kaden Fitzgerald, Zach Steward, and Jaden Enright. Congratulations to all, and especially to Zach Steward, our Madison County recipient! Zach is a 7th grader at Earlham Middle School. He has been a member of the 4-H Club for four years and has recently joined the Madison County Youth Beef team. He is very interested in learning how to keep records and books of a cattle operation while effectively managing a herd. He also sees himself with a future in agriculture. Now, full circle back to the theater, with a program starting in January that encourages young actors and actresses and supports the efforts of The Winterset Stage. 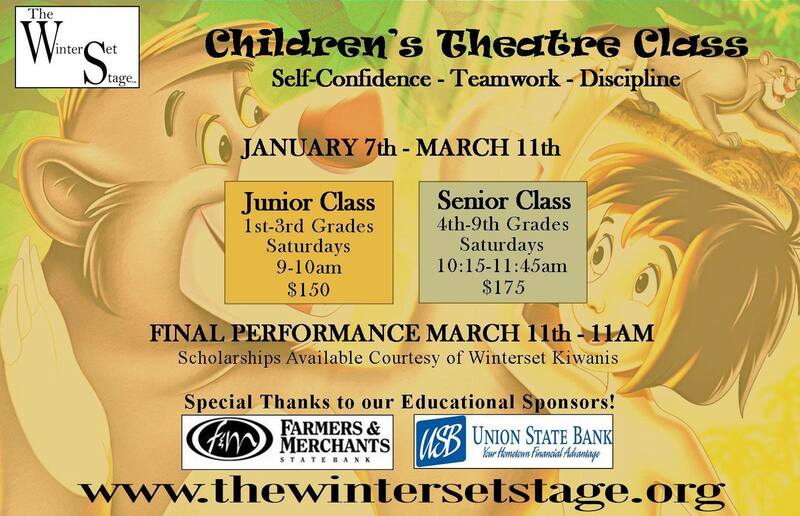 The Children’s Theater Class is the cornerstone educational offering of the organization, and it would make a great gift for any young person who’d like to get involved. 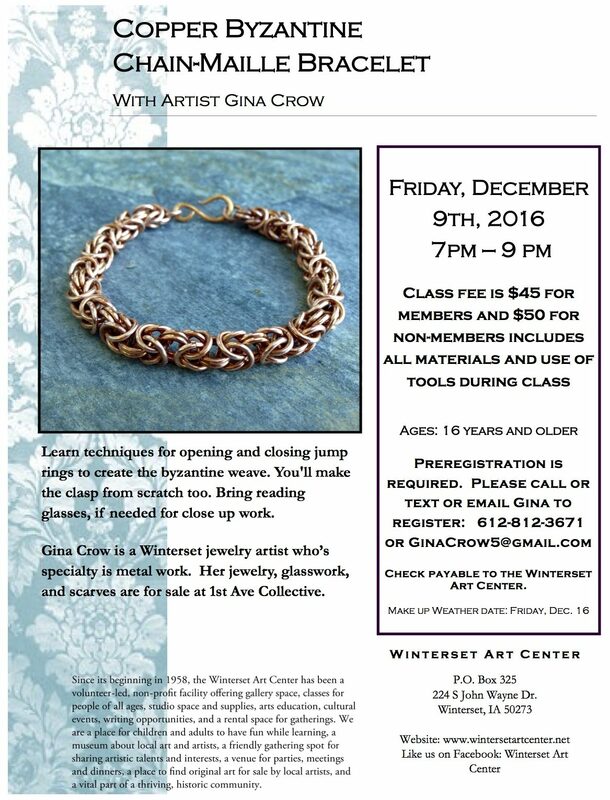 Call to reserve a spot for your 1st through 9th grader, and give them something to look forward to in 2017. 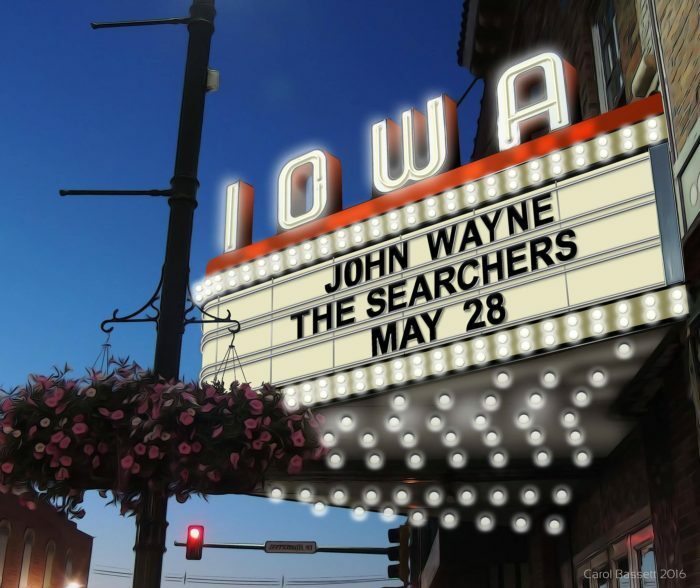 Someday they could be on stage at The Iowa Theater, or beyond!